Egg hunt for ages 0-10 yrs. begins at 10 am on the grounds of the Sisters of St. Francis. Don't forget to bring your camera. After the hunt, refreshments will be served in the Twister Cafe' in ICA Hall. Questions? 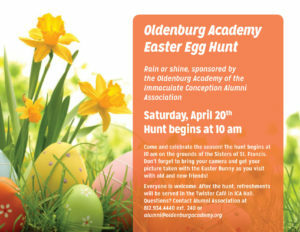 Contact Alumni Association at 812-934-4440. Batesville United Methodist Church will hold its annual Easter Egg Hunt on Saturday, April 20, 2019, at 10:00 a.m. The event is open to toddlers to 12 year olds and will feature the egg hunt, refreshments, fellowship, fun and prizes to be given away. Come and join the fun!